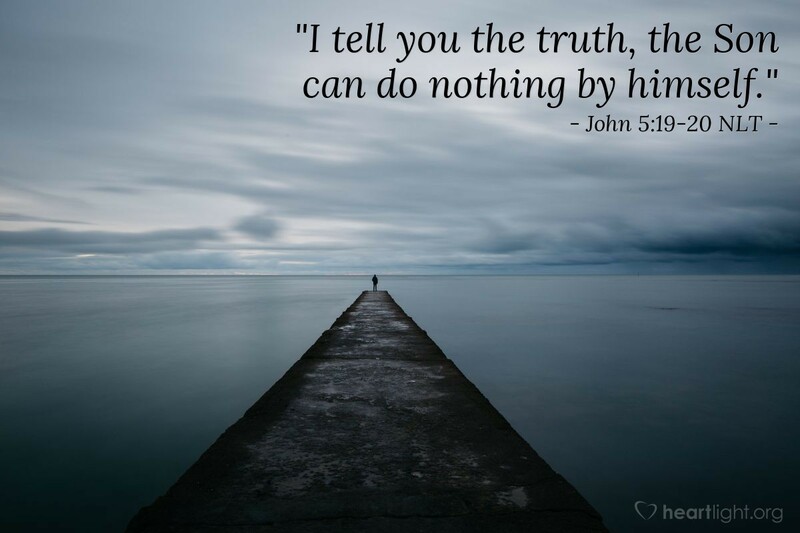 So Jesus explained, "I tell you the truth, the Son can do nothing by himself. He does only what he sees the Father doing. Whatever the Father does, the Son also does. For the Father loves the Son and shows him everything he is doing. In fact, the Father will show him how to do even greater works than healing this man. Then you will truly be astonished." Astonished? Yes, that is the word for it. Jesus will do many more miracles in his ministry, he will touch many more people, and he will teach many other awe-inspiring truths. The people around Jesus haven't begun to see all that the Father will reveal through his Son. The greatest of the revelations, however, will bring the people to full astonishment; the Father will raise his Son from the dead and bring him back to life in their presence. They will be astonished. Then some of them will begin to do great works in his name, and the work of Jesus will continue to astonish as he works through his disciples. Jesus' work is astonishing! And, if you will look closely, some of that astonishing work is being done in you! Righteous and Almighty God, your power is incredible, and your holiness is unapproachable. Thank you for bringing this astonishing set of characteristics together in Jesus and then sharing Jesus with us as our Savior. Give me eyes to see his astonishing work, not just as I read the stories of his life, but also as I live for him and he does his work through me. In Jesus' name, I pray. Amen.